The Land Transportation Office or more popularly known as LTO has their official website located at http://www.lto.gov.ph. I found out that the domain expired last July 19, 2009. Does that mean that the online service has been discontinued ? Could it be that the website is still fully working and just an oversight to renew the domain ? So as for the online part, it's offline. But much worse is that the domain has expired making it up for grabs. Let's hope that a promoted online service stays online. Nice post po. Sayang naman if they are using the expired domain for a number of years. I don't think they forgotten to renew though. For me, I like the lto.gov.ph. Mas maganda ang .gov if you are running a government agency than the .net extension. 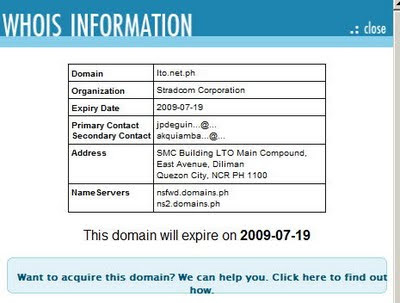 @Raquel i think more of marketing strategy yung paggamit nung .net domain. their primary site is still the lto.gov.ph . tingin ko mabuting pinagsama lahat into one site than make another one with the functionality. whaddyathink?